Friday, May 11 was a night of celebration, at a private party hosted by Hot Chocolates, in downtown Courtenay. The occasion? The prize presentations at the second annual Valley Vonka & the Hot Chocolate Factory, presented by The Comox Valley Record and Courtney & Anglin Realty in partnership with Hot Chocolates, Sure Copy, and Isla Designs. Five lucky participants, who bought specially designed (by Hot Chocolates, of course) Valley Vonka chocolate bars found “Golden Tickets” inside the wrapping. Those tickets qualified the winner for one of five fantastic prizes. 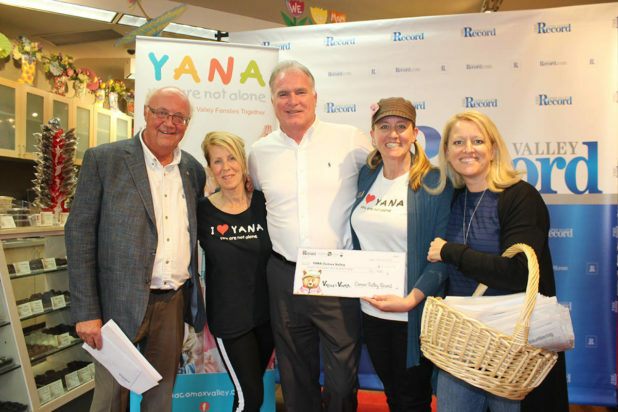 The promotion was all in the name of one of the Comox Valley’s most recognized charities: You Are Not Alone (YANA) – a community organization that offers financial and accommodation assistance to Comox Valley families who need to travel to access medical treatment for their children. The prizes included a family pack of gold season tickets (two adult, two children) courtesy Mount Washington Alpine Resort, as well as getaway packages from Crown Isle Resort & Golf Community, Old House Hotel & Spa, Kingfisher Oceanside Resort and Spa, and Ucluelet’s Black Rock Oceanfront Resort. In addition to the Golden Ticket prizes, there was also a children’s colouring contest that ran concurrently. More than 200 entries were received and judges had a most difficult time selecting two winners, who each received a year’s supply of chocolate, from Hot Chocolates. The biggest winner of the promotion was YANA, as representatives from the charity were presented with a cheque in the amount of $8,079.75. Thanks to everyone who participated by either buying a Valley Vonka chocolate bar, or by entering the colouring contest. 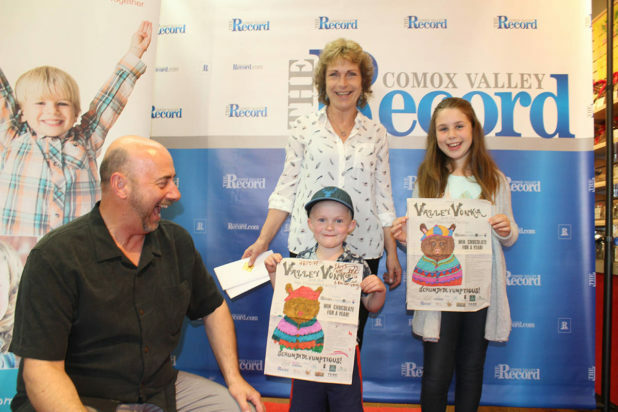 Hot Chocolates owner Jorden Marshall and manager Michele Henry present the Valley Vonka colouring contest winners Grace Stegall and Louis MacDonald-Ward with their prizes: a year’s supply of chocolate from Hot Chocolates! Grace, 10, won the 6-12-year-old category, while Louis, 4, won the five-years-and-under age category. Photo by Terry Farrell.